The boom in alternative energy stocks has given rise to a boon in alternative energy ETFs. More than a half-dozen funds launched in the past two years, and more are on the way. The newest wrinkle is funds that focus on specific technologies. Specifically, two ETFs have launched in the past month that provide access to the solar energy market. How should investors choose between the Claymore MAC Global Solar Energy Index ETF (NYSE: TAN) and the Market Vectors - Solar Energy ETF (AMEX: KWT)? The choices aren't obvious. Both funds offer exposure to the global solar energy market and both charge 0.65% in expenses. But if you dig deeper, there are important differences that will translate into different performance in different cycles. The place to start is with the index methodology. The Claymore ETF (TAN) tracks the MAC Global Solar Energy Index, while the Market Vectors ETF (KWT) tracks the Ardour Solar Energy Index. Both indexes aim to provide global exposure to the solar energy market. Both hold stocks listed on exchanges in developed markets around the world, although many of those stocks are headquartered in emerging markets like China. The challenge in creating a good solar energy index is that many players in the solar market are conglomerates: giant companies like GE that get just a small fraction of their income from solar energy. The success or failure of the solar market won't have much of an impact on these diversified behemoths. So, including them in an index in theory at least makes the index less sensitive to the solar market. To avoid this problem, both indexes have screens and/or weighting systems in place to emphasize "pure plays." Companies that generate more than 66% of their revenues from solar energy are represented at full market capitalization. Companies that generate between 33-66% of their revenues from solar energy are represented at half their full market capitalization. The Ardour Solar Energy Index takes a simpler and more restrictive approach. Companies must generate 66% or more of their revenues from solar energy to be included at all. In other words, all the companies in the Ardour index (and KWT) are pure plays. Which is a better approach? It's not an easy answer. The gut response is the Ardour Index. After all, the more pure-play exposure the better, right? But sometimes, as new industries develop, pure-play companies lose out to larger conglomerates, as those conglomerates bring scale and scope to the emerging industry. With a higher concentration of large-caps, the MAC Global Solar Energy Index would benefit if this happens. Will that happen in solar? There's no way of telling at this point. Really, both methodologies work. An educated guess is that the Ardour index (and the KWT ETF) will be more sensitive to developments in the solar energy market, offering both more upside potential and higher risk. The MAC index (and TAN) will be less volatile and offer steadier exposure to a broader market. Such an early assumption of risk is backed up by index-level fundamentals. The Ardour Solar Energy Index is the more growth-oriented index, with an average P/E ratio of 65.61 compared with 44.8 for the MAC index. Similarly, the average price-to-book ratio for Ardour is 5.75 compared with 5.2 for MAC. Typically for ETFs, it might be wise to refrain from looking at component-level data. Generally, you're looking for well-diversified exposure to an asset class. 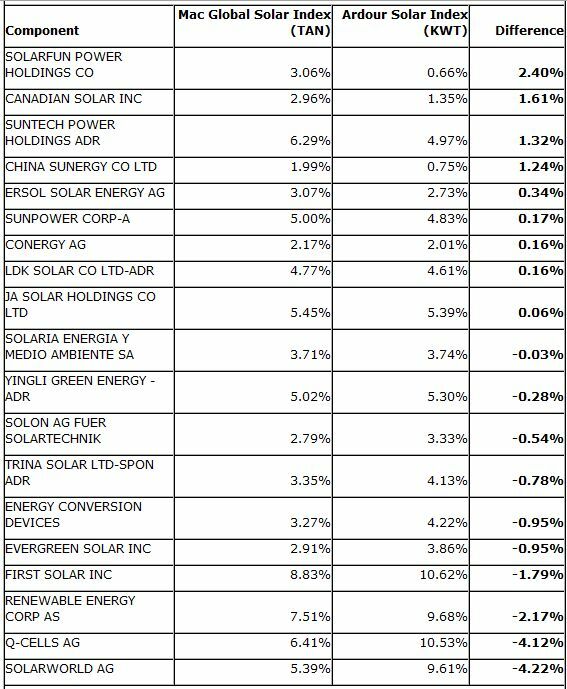 But the solar energy market is a small market, and these are very focused ETFs, holding just 27 companies each. As a result, it makes sense to evaluate the ETFs on a company-by-company basis. The two indexes have significant overlap, sharing 20 components (albeit at different weights) with seven distinct components each. Figure 2 lists the 20 components held in both indexes, along with their weights. The table is ranked by the difference in weighting between the two indexes. Figure 3 lists the components that are unique to each index, along with their weights. The MAC Global Solar Index has a much higher weighting of unique components: 18.34% vs. 5.91%. This is because the Ardour Solar Energy Index is more concentrated than the MAC index, with higher weights in the components shared by both indexes. For instance, while the Ardour index has 45.8% of its portfolio in its top five holdings, the MAC index has just 34.5%. Similarly, the top component in both indexes is First Solar, a manufacturer of thin-film solar panels. But it has a 10.62% weight in the Ardour index, and just an 8.83% weight in the MAC index. What can you learn from these component lists? Let's look at the five components with the largest weight differences in the two indexes. The single largest difference is MEMC Electronic Materials (NYSE: WFR), a U.S.-based company that manufacturers silicon wafers used both in solar devices and computers (memory, logic, microprocessors, etc.). MEMC has a 4.63% weight in the MAC index and a 0% weight in the Ardour Index, ostensibly because it does not meet the 66% revenue requirement. The company is a major and growing player in the solar industry, but the bulk of its business is tied to computers. Next up is Solarworld AG, a German company that manufactures solar energy panels for everything from large-scale solar plants to single-family homes. It is included in both indexes, but has a 4.22% higher weight in the Ardour Index, thanks to that index's greater concentration. 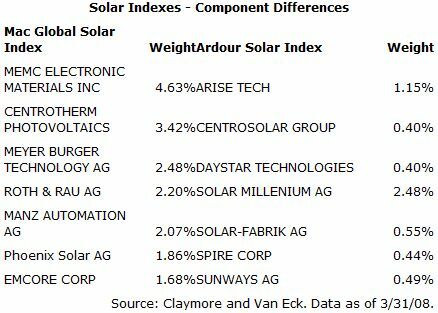 The Ardour Index also has a much higher weight (4.12%) in Q-Cells AG, another German solar cell manufacturer. CentroTherm Photovoltaics, meanwhile, merits a 3.42% weight in the MAC index and no representation in the Ardour index. The newly public German solar cell manufacturer will likely be included in the Ardour index in June, the next date for adding new components to the index. Finally, Meyer Burger Technology AG, a Swiss company, has a 2.48% weight in the MAC index and no representation in Ardour. The company is a precision manufacturer of cutting instruments used in a variety of high-precision industries, including solar, semiconductors and optics. It's a supplier to the solar industry, but likely excluded from the Ardour index by the 66% rule. If an investor has strong feelings about any of these companies, or the markets they are in, that could tilt the decision on which index (and therefore which ETF) is preferable. Of course, the big unanswered question for now: Should you invest in the solar energy market at all? Like all niche ETFs, solar energy shouldn't form the core of your portfolio. But these funds can make sense as a small segment of a portfolio if an investor believes the solar energy market will do well. Which fund to choose? It depends on your perspective. The two underlying indexes are similar, and the expense ratios are identical, so I imagine that they will trade in similar patterns. The choice really comes down to where you want to position yourself on the risk/return platform. Do you want absolute pure-play exposure and a tilt toward growth and smaller capitalization stocks? Choose the Market Vectors KWT ETF. Do you want a broader and (possibly) less volatile portfolio? Choose the Claymore TAN ETF.